Includes GRA KDF55 + Coconut Shell Carbon single cartridge filter in 10" 45,000 gallon or 20" 80,000 gallons. CuZn has created a smarter smaller option for small homes, apartments, summer cottages, inlaw quarters, etc. Their patented Foam Technology allows them to combine medias in a single Big Blue cartridge with minimal pressure loss. CuZn's custom systems come in 10" 45,000 gallon or a 20" 80,000 gallon tank. 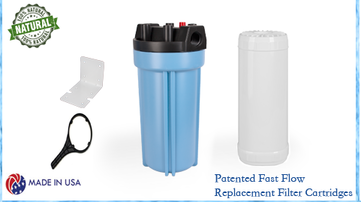 CuZn's water filters combine the technology of CuZn's fast flow GRA (Granular Radial Axel) cartridge with KDF55 and the highly rated Activated Acid Washed Coconut Shell Carbon. GRA media contains Acid Wash Coconut Shell Activated Carbon and KDF55 to remove or reduce chlorine, DBP’s, herbicides, pesticides, heavy metals and other contaminants. Dimensions: 7 3/4" x 24"
Dimensions: 7 3/4" x 14"